Is Vaping Nicotine Bad for You? Get Juiced at the Best Vaping Site for Adult Nicotine Users! Vape juice may contain nicotine. VaporScapes.com is intended for an adult audience. Vaping might help you stop smoking; however, that will only work if you purchase a vaping device that you enjoy using and that satisfies the mental and physical reasons that keep you smoking in the first place. If you’ve tried vaping before without much success, be sure to consider the best vaping devices to stop smoking in 2019. Even here at Vapor Scapes, former smokers took years to turn to vaping because they did not select a good e-cigarette for smokers nor did they choose the right e-liquid. Of course, the juice that you can buy for your vape may very well depend upon the device you choose. Love them or hate them, Juul vaping devices have become the most popular choice in the United States. According to CNBC, plenty of adult smokers have managed to replace cigarettes with a Juul too. One of the first reasons that they made this list is because the devices and the proprietary nicotine salt pods are commonly available at gas stations and corner stores. The nicotine salt juice delivers a good nicotine punch without tasting harsh, so these slim devices can do a good job of satisfying nicotine urges. Finally, the Juul is really easy to use out of the box, and that’s true even if you have never vaped before. You simply pop in a pod and inhale. 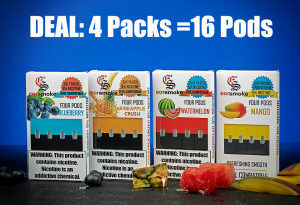 If you’re savvy, you can find some YouTube videos that will show you how to pry off the top and stopper to refill the Juul with much cheaper nicotine salts that you can buy online or at a local vape shop. Some other companies, like OVNS, produce refillable pods that will work with a Juul and one of their own devices. 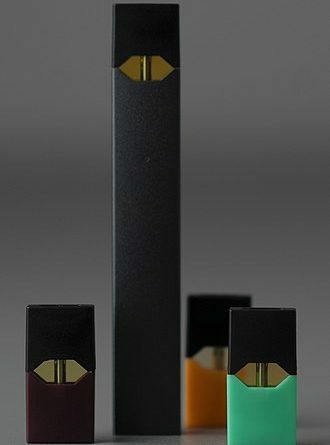 Still other brands, notably EonSmoke, make pre-filled pods that cost less than Juul pods. Again, you can find them online or in some vape shops. Note that the editors here have tried both the Juul-compatable OVNS pods and device. They both earned a thumbs up for quality, and also, you don’t have to use the Juul proprietary charger with them. You can charge the OVNS JC01 with a normal charger. On the other hand, the EonSmoke Mango pods offered a good flavor, but they seemed to leak a bit and get consumed really quickly. If you’d rather just start with a refillable device that’s still very easy to use, you might start with a popular pod mod like the Smok Novo or the Smok Nord. Both devices are similar in price, affordable (especially at good, online vaping shops), and refillable. The Novo pod contains a coil, so you must replace the entire pod/coil combo when the coil or wick get used up. You can replace the Nord Pod, but you can also simply replace the coil. This makes the Nord potentially cheaper to use in the long run, but the Novo is still simpler in this respect. The Nord is a bit bigger, and you do need to push buttons to turn it on and to get it to fire. 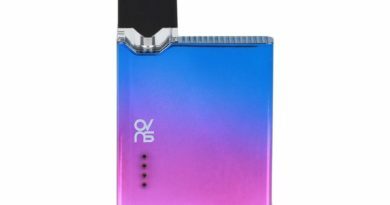 The Novo is easier to use because it relies upon an auto-draw system that functions more like a Juul and a regular cigarette. The editors here have enjoyed the Nord a bit more once they adjusted to it because it has a bigger battery and a longer battery life. Still, the Novo is much easier to use, so it might be a better choice for a beginner. One problem with the Novo is that the pod and contacts must be cleaned regularly or else juice will leak into the pod and cause auto-firing problems. At that point, it’s probably prudent to discard the device and buy another one. Nobody here has experienced that problem with the Smok Nord. If you don’t mind pushing a button, the Nord will probably give you a greater value for your money and more satisfaction. This device is still pretty easy to use, but it’s a little more challenging to fill than the Smok Nord and Novo and certainly the Juul. Still, it delivers the smoothest puffs and a more intense flavor than the options outlined above. While you do need to change the coils by screwing the old one out and the new one in once in awhile, you don’t need to replace pods. Like the Nord, you need to turn it on by pushing the button. After that, you can either push the button to inhale or use the auto-fire feature. Do You Have a Favorite Vaping Device for Smokers? Please share your experiences with quitting smoking with vaping in the comments below. The best vaping device for smokers won’t be the same for everybody. 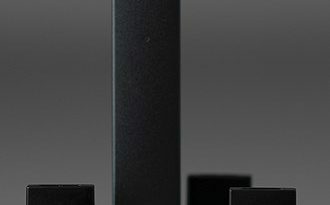 Juul Product Review:Why is the Juul Vaping Device This Popular? This is really in-depth. Finding the right device should make all the difference! Juul still remains the best I have tried so far. You’ll see a lot of tutorials online on how to use it and all that. Once you get a hang of it, you’ll find satisfaction in it. I’ll recommend it. Yes, most of the controversy about vaping comes from an increase in teens and very young adults who have turned to vaping but never smoked cigarettes. I mean, this was brought to help people quit smoking not introduce them to it in the first place. Nicotine interfere with the development of young brains and can be highly addictive so it will do these teenagers a lot of good to not even look in that direction. Oh, now people no longer vape for only the nicotine? They now sell vaping juice with THC? Now I’m not sure what exactly is the problem and how we can cut down on the use of such. Though you may still feel like you are getting the satisfaction you need while vaping, it can still take time to fully turn to vaping because you may not be all lucky when selecting a good e-cigarette or even the right e-liquid. But once you do, you should be fine. I’m actually new to all this so I want to get as much information as I can before switching over to it. I’ve been hearing that it’s a safer and healthier choice than cigarette and I’m willing to give it a try. I hope I get it right at first. I still say vaping over smoking cigarettes. Though some things can be abused for no reason we still can’t help it. But let’s try talk to people we know are involved to remind them about what they are going into since the benefit of adult vaping has turned into a negative one for teens. I’m going over this guide again because I’m still stuck trying to choose a device and juice. I’ll love one that comes with CBD oil and it’s a great option. Maybe I’ll also start the pen vaping device and see if that works for me. Even if vaping is safer than cigarettes, it’s still not totally safe. All these things we see teenagers using around contain harmful chemicals and particles which is in no way helpful to the lungs. Do E-Cigs Contain Tobacco (and Why it's Important) - Vapor Scapes on Is Vaping CBD E-Juice Legal in the USA? We're dedicated to building the best vaping community for people who want to vape in order to quit smoking, relieve stress, or simply enjoy vaping flavors. Read and discuss tips to quit smoking with vaping, vaping device and e-liquid reviews, and much more. Copyright © 2019 Vapor Scapes. All rights reserved. Are you old enough to vape? You may need to be at least 18 or 21 where you live to vape.